Country negotiators are meeting on September 3–9 in Bangkok, Thailand, to make progress on the Paris Agreement’s implementing guidelines—also referred to as the “rulebook.” These "rules of the game" are essential to make the Agreement operational. Signatory countries set December 2018, the date of COP24 in Katowice, Poland, as the deadline for the adoption of the implementing guidelines. Without, clear, robust, and cohesive implementing guidelines, the Agreement may not turn into the functioning process we envisioned and celebrated back in December 2015. Clear guidelines allow all Parties to understand the Paris Agreement’s processes and what is required of them to implement the Agreement. Robust guidelines will ensure that the Agreement is implemented on a level playing field and that country communications on emissions and progress on mitigation and adaptation measures reflect accurate accounting of those emissions and progress. Cohesive guidelines will reflect and incorporate linkages across the various components of the Paris processes, and facilitate their effective implementation. Though running out of time to meet their deadline, Parties have a couple of extra resources to help advance the discussions in Bangkok. At the end of the May negotiations, countries tasked the negotiation leaders to help advance discussions by releasing negotiating tools. These tools would streamline the approaches under discussion and outline ways countries could advance toward the final text of the implementing guidelines. As mandated, the co-chairs made the tools available in the beginning of August, allowing time for countries to consider them in their preparations for the upcoming discussions. These tools are a step forward in the process; they certainly will help achieve the first objective. But negotiators will still need to make substantial progress to deliver a draft by the end of the Bangkok session. 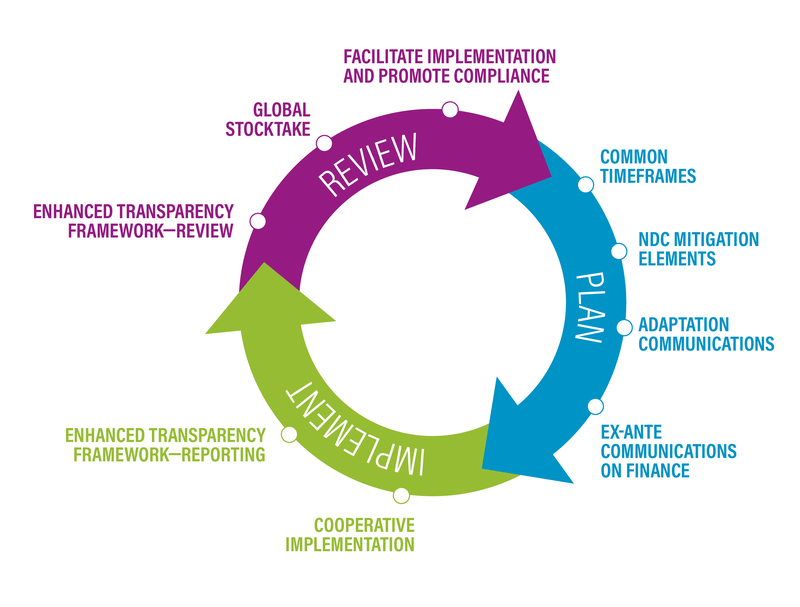 To help advance the remaining negotiations, earlier this month, WRI and the Project for Advancing Climate Transparency (PACT) released a new publication which brings together the different elements of the implementing guidelines. The paper, Setting the Paris Agreement in Motion: Key Requirements for the Implementing Guidelines, provides suggestions for negotiators as they work to meet their December 2018 deadline. Making recommendations on the way governments set goals for a common implementing period; cooperate through market and non-market processes; communicate, report and review national or collective efforts and progress; and offer predictability of financial support to developing countries. The cycle of planning, implementing, and reviewing progress on climate actions and support is an essential component of the Paris Agreement’s approach. As part of the planning phase, countries develop and share their climate plans (as nationally determined contributions, or NDCs). Countries also communicate on their adaptation efforts and plans and provide indicative information on financial support. In the implement phase, countries may work to meet their contributions using voluntary international cooperative approaches and report on the progress toward their contributions to the international community and domestic stakeholders. With the review phase, countries participate in individual technical expert reviews of their efforts and share the lessons learned with the rest of the international community. Countries also participate in a global stocktaking of collective progress. A committee for facilitating implementation and promoting compliance may also assist those countries struggling to meet their requirements or address broader systemic issues. Based on these review processes, countries then begin to plan for their next set of contributions. This cycle can also guide countries in understanding the Paris Agreement’s iterative approach to scaling climate action and support. It is not only a useful tool to illustrate how the various elements of the implementing guidelines relate to one another, but also highlights how countries approach climate action in their own domestic contexts. For each element of the cycle illustrated above, this paper highlights the main challenges, core requirements and implications for other elements of the implementing guidelines, and identifies some of the technical elements that may require further elaboration post-2018. By providing a narrative and comprehensive set of benchmarks for the elements of the Paris Agreement’s implementing guidelines, the paper should help facilitate meeting the objectives of the Bangkok session, including translating options into legal language and having a negotiating text before leaving Bangkok. Beyond Bangkok, this paper will help policy makers, practitioners, the private sector, civil society to navigate through the guidelines and, through enhanced cooperation, facilitate implementation on the ground to bring the Paris Agreement to life.